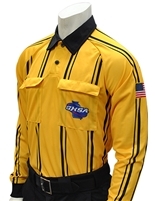 Smitty "GHSA" Short Sleve Soccer Shirt GHSA Dye Sublimated Long Sleeve Football Shirt with GHSA Logo and USA Gold Border Flag New manufactured in the USA Dye-Sublimated powder blue umpire shirt complete with Georgia High School Association (GHSA) logo and USA flag on left sleeve. 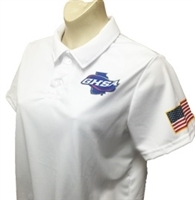 New manufactured in the USA Dye-Sublimated navy blue umpire shirt complete with Georgia High School Association (GHSA) logo and USA flag on left sleeve. The Elite Performance heavyweight interlock fabric allows breathability for maximum comfort. 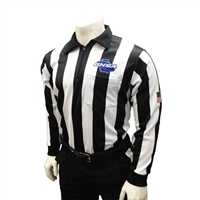 Stay warm during cool weather games intros durable long-sleeve mesh umpire shirt. 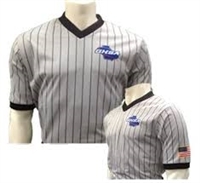 WE CAN OFFER THE DYE SUBLIMATED SHIRTS FOR IMMEDIATE DELIVERY GHSA Navy Mesh Umpire Cap. The Pulse FlexFit umpire hat is unique in fit and the ability to keep you cool. 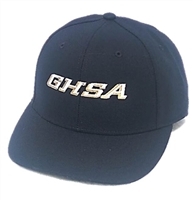 Available in all three visor sizes: Plate, Combo and Base with "GHSA" (Georgia High School Association) logo. Pro model surge fitted umpire cap available in Plate, Combo and Base visor lengths with "GHSA" (Georgia High School Association) logo.